As discussed in Dr. Justin Parente's previous post, dental operating microscopes can prevent procedural error in endodontic treatment. 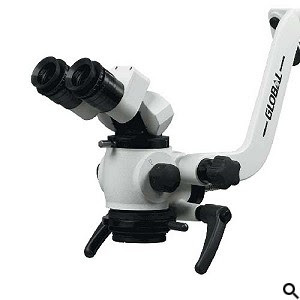 There are those who may debate this, but in my opinion, microscopes are the standard of care in endodontics. Molar endodontics should be done using a microscope. In our practice, we use microscopes on every case. Perforations happen, missed canals happen, but with a microscope (and other advanced imaging systems - but that is another post) they are much less likely to occur. The following case is that of a root perforation, it's microscopic retreatment, repair using MTA and the 6 month recall showing healing. This patient was referred to Superstition Springs Endodontics with the complaint of "constant pain on lower right". Our diagnostics found #30 with Prior RCT and symptomatic apical periodontitis (SAP). He reports that this root canal was done 1.5 yrs earlier by a general dentist. As you can see in the radiograph, there is a large pa lesion on the distal root and a radiolucency in the furcation area - likely caused by furcal perforation. We discussed options and recommended retreatment with probable perforation repair in the pulpal floor. 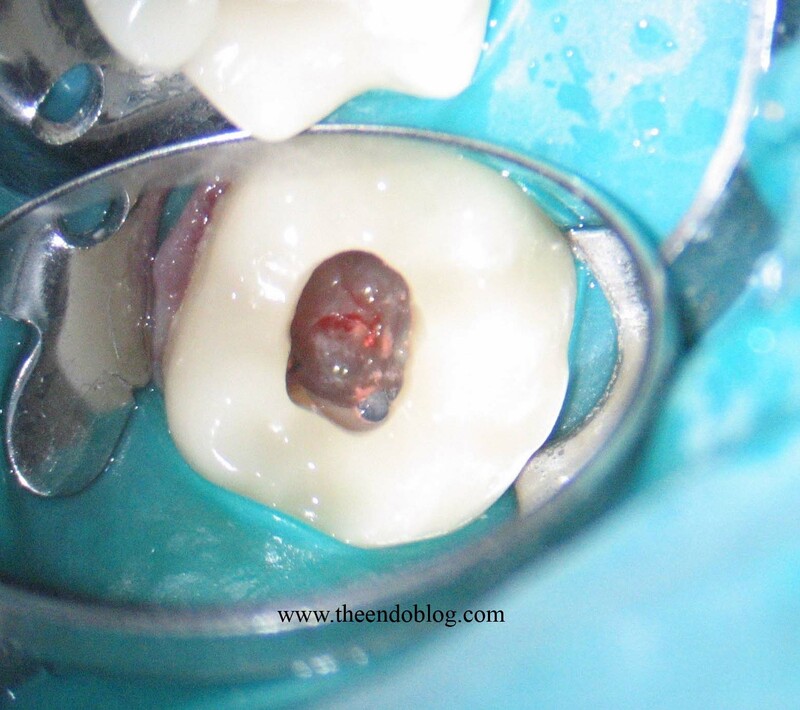 Upon access, we found a furcal perforation that had been covered with resin buildup material. RCT retreatment was completed. By using a microscope, we were able to locate a 4th canal that had previously been left untreated in the distal root. We also repaired the pulpal floor perforation using MTA. 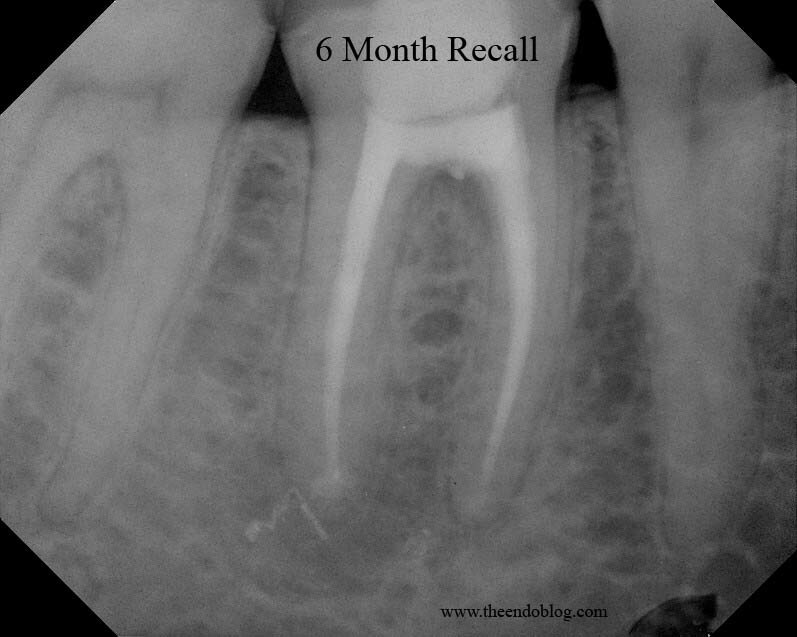 At 6 month recall, you can see that the periapical lesion has healed very nicely. The bone loss in the furcation area has also improved. The patient is functioning on this tooth and is asymptomatic. He occasionally reports some swelling adjacent to the tooth, but upon our clinical exam today, probings are normal and there is no sign of irritation or infection. 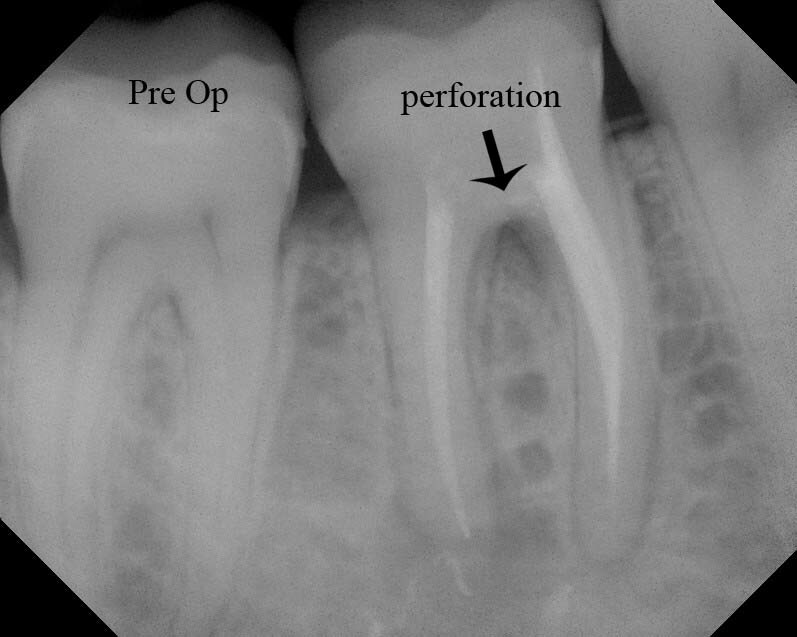 Prevention of root perforation is always better for the long term prognosis than perforation repair. Use of magnification and lots of light (microscope), understanding pulp & canal anatomy, proper use of high & slow handpieces and ultrasonics, recognizing buildup material from dentin of the pulpal floor are all important factors to help prevent root perforation. 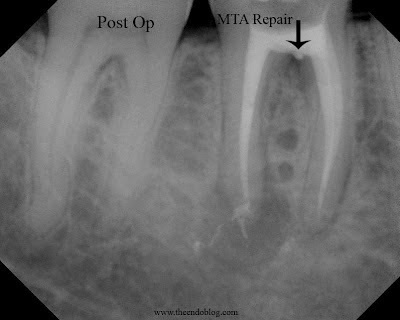 With that said, if perforation occurs, the patient should be informed and the perforation should be repaired immediately with MTA. Proper management following root perforation can allow the tooth to be retained. Endodontists are specialists in saving teeth.